A bear habituated to humans often becomes a dead bear, according to Central Island conservation officer Steve Ackles. Two bears grapple over a salmon in the estuary across from Victoria Quay at dusk. A bear habituated to humans often becomes a dead bear, according to Central Island conservation officer Steve Ackles—and there’s no excuse in a city with BearSmart status. “Port Alberni has got BearSmart status and the city, BearSmart and the conservation service all together have spent a great deal of time and effort to save bears,” said Ackles. 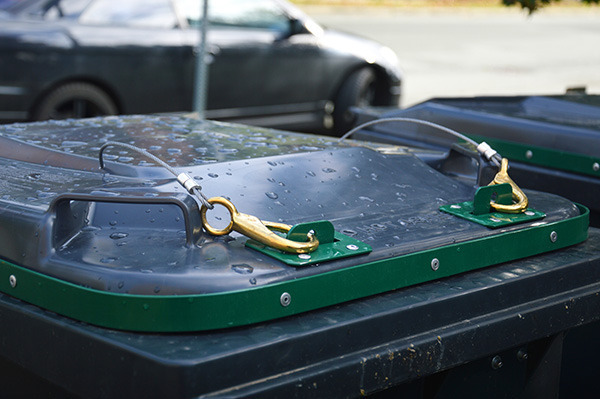 That includes the bear resistant garbage containers (pictured below) within the city—of which the city has plenty of, are free of charge and just a phone call to the city public works yard away. The phone number is 250-720-2840. With such easy access, Ackles and his fellow conservation officers are having their patience tested by residents’ lack of compliance. “All the people involved have put in a huge amount of effort and a lot of work to make it a BearSmart community and it’s awfully frustrating to see all this work being done by people in the government and non-government groups and people leaving these garbage containers open and the bears getting the reward,” said Ackles. Once a bear becomes habituated to humans, Ackles adds, there’s not much that can be done to save it. According to the Ministry of Environment’s WildSafe BC Wildlife Alert Reporting Program, one black bear was destroyed by conservation officers within the Alberni Valley in October of this year. Destroying bears is a last resort, Ackles said. Of the 94 bear-related incidents reported up to Oct. 20 of this year, 38 were considered to be food-conditioned—17 of those were to garbage, and 16 to fruit trees. Bear sightings have increased from last year; from Jan. 1–Oct. 20, 2014, 60 bears were reported and 31 were food conditioned. For 2015, the number of bears destroyed is likely to increase. Part of that is due to the unusually bear heavy year the whole province has had. “Throughout the province we had a very strange year in weather,” he said. Most of those calls don’t result in action by the conservation department but they do have traps set for several bears throughout the city. “At this time of year, bears go into hyperphagia where they’re trying to gain on as many calories as they can—fish are in the rivers, the berries are coming to an end, they’re trying to get ready for hibernation,” said Ackles. But on Vancouver Island, not all bears hibernate. This makes garbage not a summer-only treat for bears conditioned to consider it an easy meal, which makes using bear-resistant garbage containers just as important even when bears traditionally hibernate. That means that people need to not only bear-proof their garbage, but make sure their neighbours are doing the same. “If you have a neighbour that’s leaving their garbage unlatched or not in a bear-resistant container, report it to bylaws,” Ackles said. Many of the calls conservation gets of bears in neighbourhoods come from people without bear-resistant garbage bins, said Ackles. While even if all garbage bins were bear-proofed there would still likely be some bears wandering around, Ackles said that the number would be a miniscule amount in comparison.